Outs: Saints: Clark (shoulder), Hartley (concussion), Dickson (concussion), Foden (groin), Dickinson (knee), North (knee), Stephenson (foot), Gibson (ankle), Fisher (arm), Fotuali’i. Saints: Tuala; K Pisi, G Pisi, Burrell, Elliott; Myler, Kessell; A Waller, Haywood, Brookes; Craig, Day; Lawes, Wood (c), Harrison. Replacements: Marshall, Ma’afu, Hill, Matfield, Nutley, Hanrahan, Mallinder, Collins. Leicester: Tait; Veainu, Betham, Tuilagi, Goneva; Burns, B Youngs; Ayerza, Thacker, Cole; Barrow, Kitchener; Fitzgerald, O’Connor, McCaffrey. Replacements: Bateman, Mulipola, Balmain, Slater, Croft, Harrison, Williams, Thompstone. 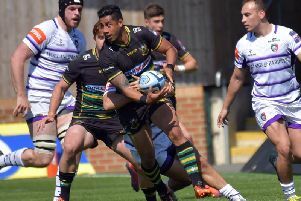 Tom’s preview: There are no meaningless east midlands derbies, but the one that lies in wait at Franklin’s Gardens this weekend is up there with the most important in recent times. Just as it was when Saints shot down Tigers in that famous Premiership play-off semi-final back on that balmy May night in 2014, the season is on the line. And how Saints need another hero - or 23 - to carry them to victory this time round. Almost two years ago, bearded warrior Tom Wood popped up to score the try that took Northampton to Twickenham, where Saracens were slayed. Now, Saints need another memorable triumph to keep their campaign alive. They are now four points behind Tigers with just three games of the regular season to go, and Richard Cockerill’s side have a better wins record. That means Saints will need to finish on more points than their rivals, which neccessitates an impressive success this weekend. Jim Mallinder’s men can only afford to think about winning the match, but they must also try to deny Tigers a sniff, too. That will be some task, especially when you consider the home side’s lengthy injury list and the form of their bitter foes. While Saints were scrapping to ultimately taste defeat at Saracens last Saturday, Leicester were doing what Leicester do: peaking at the right time to take Stade Francais to task. Tigers can now look forward to a Champions Cup semi-final next weekend, and if they win this weekend, they will have a Premiership play-off semi-final in their sights as well. For Saints, everything is riding on defeating their local rivals. They have to do what they have done best during this turbulent campaign; they have to continue to be predictably unpredictable. They need heroes, just as they’ve had in their past two home games against Tigers. That semi-final stunner, which saw an atmosphere like no other at the Gardens, was followed by a victory with 14 men at the Gardens in December of the same year. Saints stood tall against adversity. They stood tall after Salesi Ma’afu’s red card in that semi-final won by Wood. They stood tall after Dylan Hartley was sent off in that tempestuous December encounter. And now they must stand tall again to keep their title hopes alive. If they can prevail on Saturday, Saints can use the victory as a catalyst. They can gradually look to get players back and build towards more the final two games, against Gloucester and Bath. Lose, and those matches will merely be used to try to hold on to a top-six spot. Put simply, this game couldn’t be much bigger - and we haven’t even mentioned the prized bragging rights yet!